What is the lowest octane an RX8 can safely use? to head off the questions about 98 octane...that's 98 RON, which is equivilent to 92/93 octane here in the states. I use 91 in my 8 and it runs great. The wife put in 87 from the same station and it knocked like a bunch of vacumn cleaner salesman at the front door. It was a bad sound. But it was summer here in Arizona and probably about 110 degrees. That I feel plays a big part in the octane used. All I know is that I will never put anything under 91 octane in my car here in AZ. By the way I use QT gas which is a "Top Tier" according to BMW and Honda. Just remember that the renesis is prone to carbon buildup. Most of the higher octane fuels have extra additives and detergents to clean you combustion chambers and plugs etc to prevent this build up.I feel that the extra expense for this feature alone is well worth it. Thanks to everybody who responded, for me it is not a money issue, the car just seems to run better (seat of the pants meter) on 91 vs 93 octane. I'll try the 89, and see how it goes. To all the 87 octane people, what is your avg gas mileage? Read the 3rd and 4th posting from the above thread....by MazdaManiac and Rotarygod. I have run 87 octane a couple of times in the car and it gets "slightly" better gas mileage than with the higher octanes, but I can definitely tell that there is a power loss between 91 and 87, harder shifting, and more engine vibration. I can even tell the difference between 89 and 91. Maybe it is just my imagination, but I don't think so. I have one of the early build dates. Possibly that is why. I run 89 when I am feeling cheap and 91 when I am feeling sporty. Average between the two is just under 18mpg. And remember, if you are concerned about carbon build-up in the engine...rev it every now and then to the beep. Last edited by aggietiff28; 03-19-2006 at 02:00 PM. I was running QT when I lived there as well. I went down to the 89 and never had any difference. Even ran 87 from time-time. In the summer when they kick into the blend then definetly I would run the 91 but once they change over then you should be fine with 89 or so. But I miss the AZ year round climate!! Well, I have officially changed my tune on this subject. Replaced plugs this weekend. Based on the condition of the plugs (2 years, 14,000 miles) I would say that higher octane is warranted, at least in my case. and what is the condition of your old plugs that led you to this new assessment?? This should be quite the opposite, the lower octane will "explode" and burn faster for a more complete burn. The 93 octane will actually burn slower and if the rotary is not able to get a complete burn there is where your carbon buildup will come from. yeah but doesn't that only matter engines that aren't high compresion? High octane is more likely to cause carbon build up. More so than lower octane. Low octane (assuming the ECU is OK with it) should give you better gas milage, more power and less carbon buildup. Cars that are tuned to high octane can compress what's injected into the combustion chamber further without preignition, giving you more power. Where the RX8 falls out between these two choices I have no idea. Although it would be interesting to reset the ECU and run it on both types of gas. I know when I did I saw zero difference between the three tanks of gas of low and high octane. The only real difference I've ever seen was running nonoxy fuels vs. oxygenated fuels. The nonoxy was a considerable boost, and an additional 2 - 3 mpg more. Spalling of the center insulator nose; a classic sign of detonation. 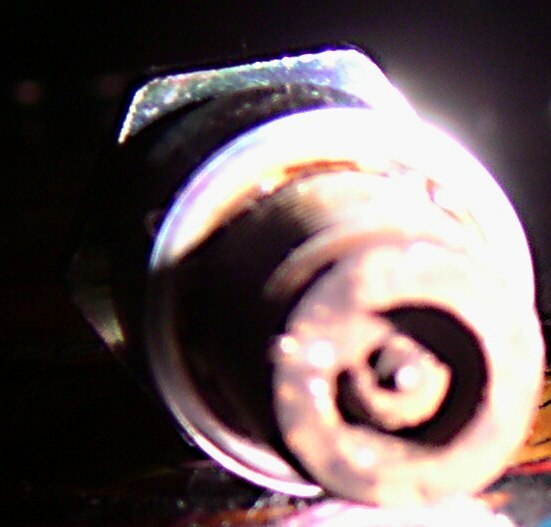 I found this condition on both leading plugs; although the one in this pic was the worse. The ground electrode was intact but I removed it for the pic. The car was running ok for the most part but had developed a mild stumble in stop-and-go traffic. It's running smoothly again now on the new plugs. My ghetto compression test (coasting down a long, steep hill nearby in 2nd gear) yields the same terminal velocity of 34 mph that it always has. 87 octane here for 43k miles. and my car was the one that scott at mazsport beat up. about every 15k miles i run a can of b&g 44k in the tank. btw. my mpg average is over 21 mpg. No that is the nature of gasoline, not the motor. All octane does is make gasoline more stable at higher compression and heat, which in turns means it will burn slower, the higher the octane. If you have a low compression car then you have no need for slower burning fuel (high octane). Some people's 8's run just fine on the lower octane (mine does) and gets better gas mileage than if I use 93, but others have problems using the lower stuff, just depends on the car. Remember also that the combustion chamber of a rotary is much different than a piston engine, so 10:1 on a piston engine seems to be a little different than 10:1 on a rotary, and I think it has to do with the shape of the chambers. Someone correct me if I am wrong. Ok you guys are waisting your time and actually doing more damage by running higher octane fuel in a NA rotary. Some of you just don't understand how thermally unefficient the rotary is when it comes to fully burning the fuel air mixture. All higher octane gas does is burn slower. The slower burning process decreases the chances for detonation/knock. The side effect is the remaining unburned fuel turns into even more carbon deposits. More carbon just lowers your compression because the internal seals will start to stick. Why do you guys think you keep flooding so much? Flooding is a direct result of carbon infested engines. Stop worrying about detonation so much. The Renesis is NA. Detonation on a NA rotary isn't know where near as bad as detonation on a boosted rotary. Between the two, there is a huge difference between the internal combustion pressures/detonation events inside the engine. There are guys running PP NA rotaries making 300 hp and running 87 octane. I personally run 89 octane in my Fd which is boosted and it has 103,000 miles on the original engine. You have nothing to fear. Ideally what you want to do is run the the fastest/cleanest burning fuel you can in a NA rotary. 87 octane burns faster and most importantly MORE FULLY. This is what the Renesis needs. Last edited by T-von; 03-27-2006 at 02:24 AM. That sums it up. The Engineers at Mazda have no idea what they are doing. No, they do know what they are doing, they know how to market a sports car that is all. Recommending Premium fuel is a marketing strategy now-a-days where if you have to put premium in the tank it must be better. Notice Mazda "recommends" premium, they do not "require" it. It has also been said over and over some 8's love the 87 and some hate it and love 93. My suggestion is try 87 and if the car runs good on it (mine likes it more than 93) then run it, if not go back to premium. One last point, at least with my car, it feel much better on 87 than on 93, but putting a bottle of Techron in it every so often makes it idle so much smoother for some reason, and it is only with the Techron additive. i ran with a few tanks of 89. I feel no difference from 93 but psychologically I still worried about running 89 in the long run. Sorry about shouting, but ****... I filled up with 87 octane, to see how the car would run. As soon as I hit 5Krpms the engine rattled (very ugly sound) and lost power. I kept the rpms below 4K and went staight to Discount Auto Parts, to pick up octane booster. After I added the octane boost the car ran better but still rattled at 5Krpm. After I used 1/2 a tank (running at 4k or less), I filled up with 93 octane and the car is fine now. The gas was Shell (both the 87 and 93). The car runs fine with 91, and 89 seems OK, but for now, at least with my 8, 87 is just plain evil. I ran mine on 93 for the first 10K. Since I figured the computer had learned on 93, I slowly backed it off to 87. Now at 22K, and for the last 12K, my car has run fine on 87. Maybe try it gradually. Quick Reply: What is the lowest octane an RX8 can safely use?